Editor’s note: Christie Clinic is a sponsor of Chambanamoms. While we would like summer to last forever, it won’t be long until the school bell rings. 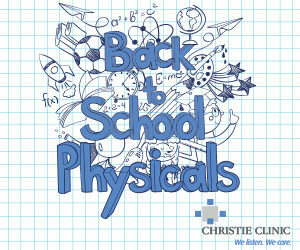 That means it’s time to schedule your child’s back to school physical. Some children will need a back to school or sports physical before they return in the fall. How often should my child go to the doctor? Parents know who they should go to when their child is sick. But regular well child visits are just as important for healthy children. The American Academy of Pediatrics recommends that children after 3 years of age get their regular well child check-ups once a year. What is the difference between an annual physical and sports physical? An annual physical is the same as the well child visit. When we do the annual physicals for kids, if they need to be involved in a sport or physical activity, the sports physical can be incorporated into that visit. School and sports physical forms will be made available if needed. The sports physical will focus on determining whether a child is safe to participate in a particular sport or physical activity or if any health problems may interfere with their participation. What examinations do schools require? It depends where a child is attending school. In the state of Illinois, children must have a physical examination prior to entering kindergarten, sixth and ninth grades. If they are current with their well child visits, the provider can give them the school physical forms needed for registration. Vaccinations are required depending on the age of the child or their vaccination status. Also ask your child’s coach or sports coordinator, they should be able to communicate the need for a sports physical and deadlines. What should I expect during the physical? The child’s height, weight and blood pressure will be checked. The provider will examine the heart, lungs and spine. Depending on the child’s age, the provider will check for signs of puberty. Your provider will also review the child’s immunization schedule. Why should I schedule an exam for my child? These examinations are a good way to check a child’s health. Much can change within a year. These exams will help your provider check your child’s height, weight, health and growth. It is always good to know how much your child has grown in the time since your last visit, talk about development and discuss developmental milestones, social behaviors and learning. Regular visits create a strong, trustworthy relationships among physician, parent and child. This team approach helps develop optimal physical, mental and social well-being of a child. Where should I go for an exam and what type of a provider can perform an exam? It is recommended that children should be seen by their regular provider so they can document your child’s progress. Different health care providers can perform a physical examination for children including, a physician, a physician’s assistant, or an advanced registered nurse practitioner. How should I prepare my child for the exam? Have a conversation. Review what the provider will doing during the exam and if they are scheduled for immunization, wait to have the discussion so they do not worry or fear about their appointment. How should I prepare for my child’s exam? If you have any concerns about your child’s health or well-being, write down a list of questions to ask the provider. Also, ask your child if there is anything they would like to ask the provider. If your family medical history or insurance provider has changed, please bring that information with you. Try and schedule your child’s appointment before school begins and even in the early summer to avoid the rush. Some camps may need a physical so you may need to schedule it in the spring. Call your provider today and discuss a good time.